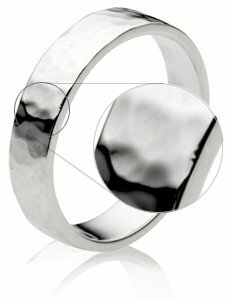 Customizing rings is becoming ever more popular, the ability to add a special finish or engraving to your rings creates a more personal touch. There are several different types of finish you can add, to make you aware of what's available we have provided an explanation for each finish below. 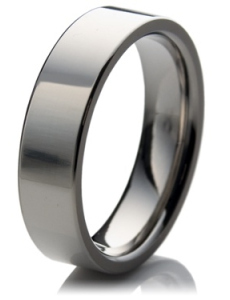 Mirror finish: A highly reflective polished finish resulting in a mirror like surface on the ring. Fine Matte finish: A non reflective finish with no apparent texture, the rings surface would have been finely scratched to create a misty look. Coarse Matte finish: A more textured finish with more obvious signs of embellishment. 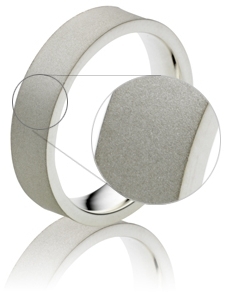 Hammered: As in the name, the surface of the ring is subjected to a tiny hammering effect, resulting in a dented surface. Sandblasted: A textured effect resulting from high pressure sand blasting. 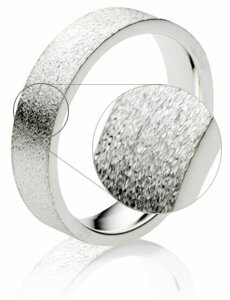 Stardust: A sparkling effect whereby the ring appears with a part polished and part sand blasted surface, giving the appearance of stardust. 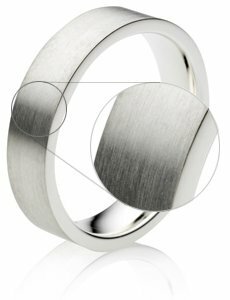 With advances in technology it has become possible to include an engraving on the inside or outside circumference of a ring. 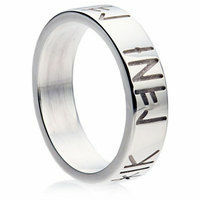 This can range from any message be it your conjoined names, date of marriage or a special lyric to each other. Click here to read about our standard engraving service. Runes and runic engravings are another trend that have recently taken off. To find out more about runic engravings visit our runic rings page.